The name Stephanotis comes from the Greek words stephanos, a crown and otis, an ear, probably referring to the way the flowers are formed in bunches. There are some fifteen known species of this evergreen climber, but only one species is grown as a house plant to any extent. This is Stephanotis floribunda, popularly known as Madagascar Jasmine or wax flower, which was introduced from Madagascar in 1839. The strongly scented white, waxy flowers, much used in wedding bouquets, corsages and button-holes, are produced in clusters in spring, and may continue through summer, on an evergreen climbing shrub, which can grow to perhaps 15 ft (4.5 m). Although the stems get very long, it can be kept under control and encouraged to flower by careful pruning and training the leading growths around a hoop of wire or cane. Madagascar Jasmine is not the easiest of plants to grow in the house, but if kept in a window where it can receive good light, it will flower well. It is really better suited to a greenhouse or conservatory, where it looks its best when trailing along a rafter with the clusters of lovely white flowers hanging down delicately. When buying, look for good, healthy, green foliage. The plant should have two or three clusters of flower buds, preferably with one or two flowers just opening. Look out for and reject plants that have dropped some of their flower buds. 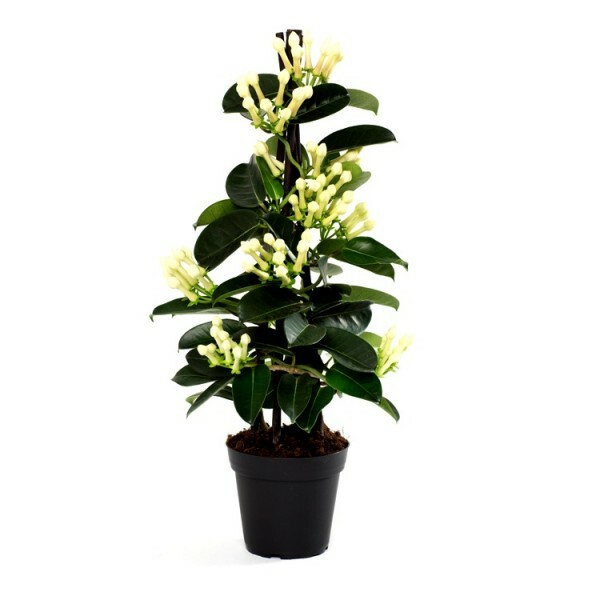 Atmosphere: Madagascar Jasmine appreciate a ventilated, but not draughty, position free from gas fumes. Cleaning: Wipe the leaves occasionally with a damp cloth. Never use leaf shine. Feeding: Apply standard liquid fertilizer every 14 days during spring and summer when the plant is growing and flowering. Humidity: They should be sprayed every day with lime-free, tepid water in summer, but do not spray the flowers. Stand the pot on damp pebbles to provide constant humidity. Light: Provide plenty of bright light, but keep the plants out of direct sunlight, which will damage the foliage. Potting and re-potting: Potting should be done in late winter, using a soil-based potting mixture. Move plants into pots one size larger in early spring. After the first 2 years, re-pot after pruning (see below) every spring. 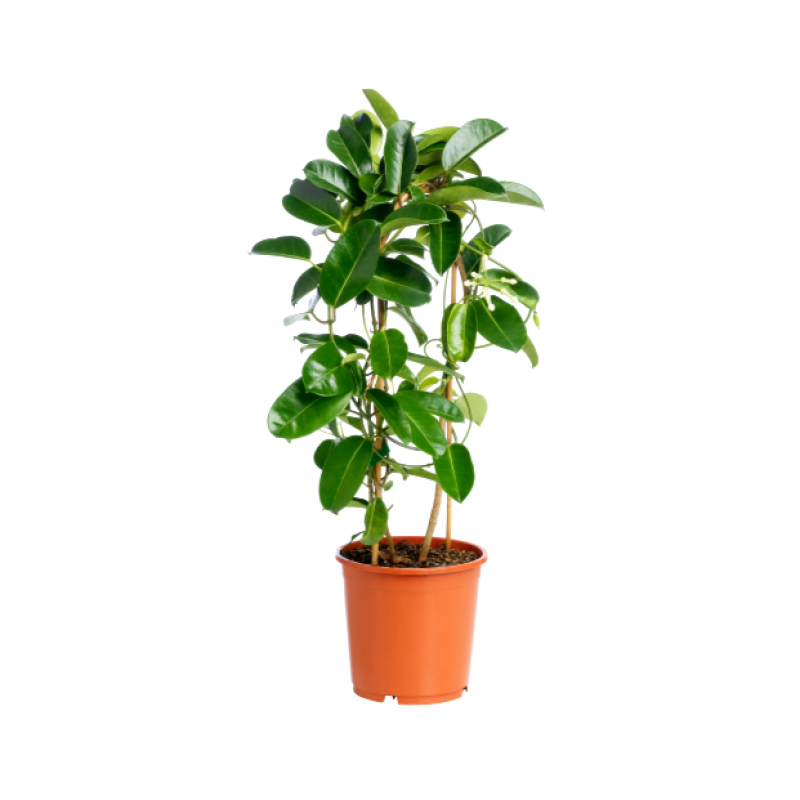 Mature plants can generally be accommodated in 5-6 in (12-15 cm) pots, but move healthy plants that continue to grow into 8-9 in (20-23 cm) pots. If the plant gets too old or difficult to move, just replace the top soil in the pot or tub with fresh potting mixture. Propagation: Take 3-4 in (8-10 cm) long tip cuttings from non-flowering lateral shoots in spring or early summer. Dip the cut ends in hormone rooting powder, and plant each cutting in a 3 in (7.5 cm) pot containing equal parts of peat moss and coarse sand or perlite. Enclose the potted plant in a plastic bag or heated propagating case and keep it at a temperature of around 65° F (18° C) in bright light without direct sunlight. Given just enough water to keep the potting mixture moist, rooting should occur in 8-10 weeks. When the new roots are well developed, move the cuttings into the normal soil-based potting mixture used for mature plants. (See step-by-step photos at right). Pruning: Cut back any straggly leading growths by about half if necessary, and cut the side shoots back to spurs of 3 in (7.5 cm) or so. Cut out all weak shoots. This is best done in spring. Temperature: The ideal summer temperature for stephanotises is 65° - 70° F (18° - 21° C), but they also do well in warmer rooms, given high humidity (see above). The maximum summer temperature is 80° F (27° C). In winter, keep them slightly cooler at 55° F (18° C). Watering: In summer, water plentifully as often as necessary to keep the potting mixture thoroughly moist. In winter, water sparingly once a week. Use lime-free, tepid water when possible.